Weighing just 55 pounds on its own, or 65 pounds with its long articulated arm attached, SpotMini skips the hydraulics that Boston Dynamics’ other robots rely on, exclusively using electric motors to move around. On a full charge it can quietly roam about your house for a full 90 minutes depending on what chores you have it doing. 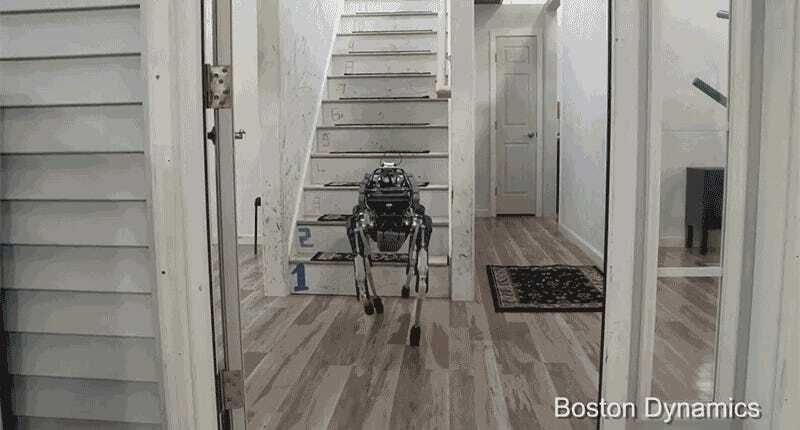 It’s got a full suite of sensors on board for navigating almost any environment, and the robo-dog can tackle stairs better than most adults can. 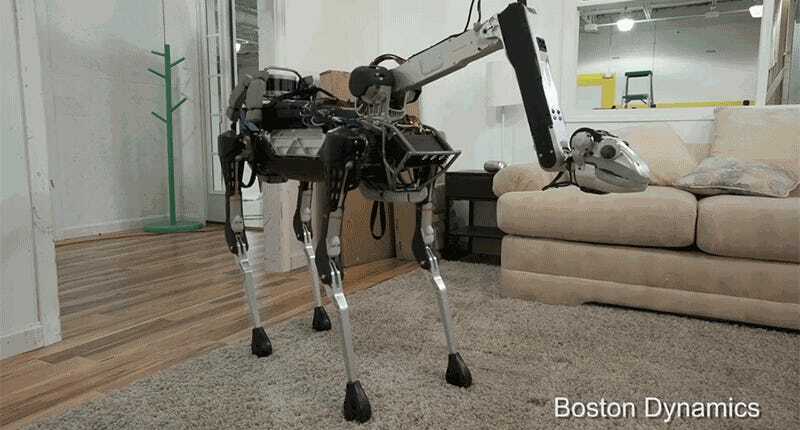 Like a real dog it can even be taught or guided by a human to perform countless tasks. But instead of just sitting, staying put, or shaking a paw, the SpotMini can perform simple household chores like delivering snacks and drinks—although clearly there are still some kinks to be worked out. That articulated arm, and the gripping head on the end of it, are technological marvels all on their own. Using a solid state gyro, it’s able to perfectly hold its position in 3D space while the rest of SpotMini is frantically moving around. In a real world situation, this would allow the robot to precisely handle dangerous or fragile materials, while the rest of the robot could reposition itself to avoid hazards or other moving obstacles.